I need to rewire a machine with new ground wire. 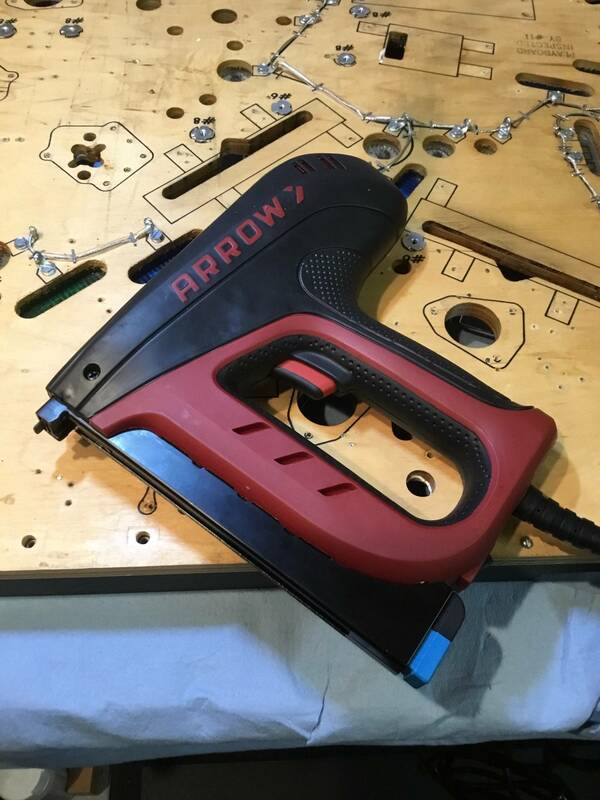 A common staple gun is highly inconvenient since it requires a lot of space and there is all kinds of machinery under the playfield. I am in search of a bright idea and/or tool how to fasten the new ground wire under the playfield that doesn't require removing a bunch of stuff. A pneumatic staple gun is a step in the right direction, but I don't have a compressor, so that option is out. Here's a Centaur restoration where foil tape was used. Foil tape, very interesting ... That would certainly eliminate the unwieldy staple gun. Until the adhesive wears off and you have long strands of bare metal suspended in your lamps, coils, and switches. This, to me, looks like an EXTREMELY bad idea. It looks very pretty, but no thanks. Also, how much current can that tape actually carry? If there were staples every few inches along the tape, I could see this working. I've borrowed a compressor and used a long nose gun like this. Believe it or not but it works just fine. Used it for many stuff. And if it does not fully go through, just finish with the hammer. Well, if you read the thread linked to the post, it was billed as a high end custom resto, and the foil tape can handle around 20A. Even Vid approved. Done for more than one machine, too. As far as foil goes, it isn't all about electrical properties, its about space.. you need a wide foil to carry 20amps. 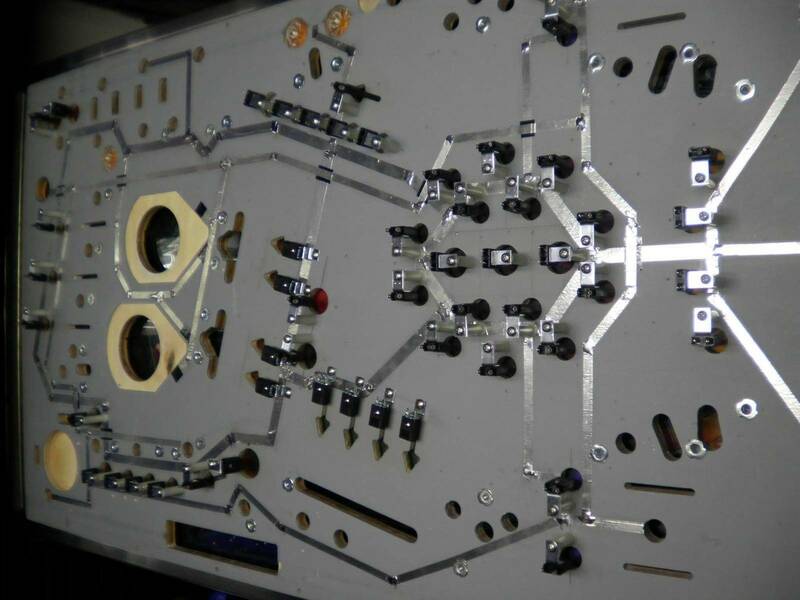 If you have swapped a early 80's playfield, there is not much room in between things. Kinda crowded. Now that I look closer, the foil is shorted against a few t-nuts. Not a good idea. I used this electric one I got at Home Depot. It worked great for me, but as you can see I removed everything. I already did that in some cases but I hate to look at some patch work. In some places the wire is only held by 1 or 2 remaining strands. I patched over those with whatever wire I had available and soldered it. Works but looks like crap. Sure, but that's what i was hoping to avoid. That long nose stapler also has an electrical version. The one I am looking at "Duo-Fast ENC-5418A Electric Stapler" is used for carpets. How powerful are those staplers? I would hate if the staple comes out on the playfield side. I wasn't able to find a less powerful hand powered version of a long nose stapler. I don't have a compressor, so that option is out. You can pick up small compressors at the big box stores for around $100. I use mine for all kinds of things. You can pick up small compressors at the big box stores for around $100. Yeah they are pretty economical anymore. Harbor freight has them under $100 that will easily do what he needs. I will have a look at those. I thought you need a much bigger an more expensive one to drive a pneumatic stapler.